← Did we mention it’s foggy? Do mountain lions like golf, want an education? Only last night the Dawn Jogger was out with a group of friends who expressed concern that she jogs alone at dawn, alone being the operative word. She tried to explain that she’s rarely alone; there are fellow morning exercisers as well as the golf course maintenance crew and others who tend the Stanford campus. Plus, while she sees her fair share of dawn creatures – raccoons, coyotes, desert hares, hawks, owls – the new concern about mountain lions, she feels is overrated. Or so she said. As usual this morning she rose before sun up and headed out across the first and second fairway of the golf course on her way to do a Lake Lagunita loop. 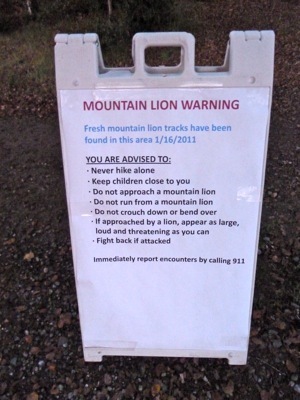 The light was still dim when she spotted the large sign warning that mountain lion tracks had been found in the area where she was – a field adjacent to the Stanford driving range that runs parallel to Junipero Serra, which happens to be quite close to student housing. As she needed to pass through a bit of foliage before getting to the lake bed, she kept her eyes and ears peeled. After circling the lake, she went back by the sign in the hopes of spotting the tracks in better light. No luck.